A dark sky party with no interference from moonlight. See Saturn’s glorious rings and several of its moons, one of which, Titan, is larger than the planet Mercury. See storm clouds on Jupiter and several of its moons. See features on Mars, including its polar caps. Distant galaxies can be seen as small fuzzy objects, but star clusters in our Milky Way Galaxy are beautiful to view. Planetary nebulae, the remnants of exploded stars like our sun can be seen. They are all part of the show during the Amateur Astronomers Association of Pittsburgh’s FREE May Star Gazing Party at Kunkle Park, in Washington Township (south of Apollo). This star gazing party is scheduled for Saturday, July 2, starting at dusk, WEATHER PERMITTING. The Amateur Astronomers Association of Pittsburgh opens both the Mingo Observatory and the Wagman Observatory to the public on Friday, July 8th and Saturday, July 9th, 2016. No reservations. No charge. No limit to group size. Just show up. Our star parties feature a rich array of celestial delights. Experience the AAAP telescopes and those of our members as they reveal our solar system and more distant objects, including galaxies and nebula. Although admission is free, we gladly accept donations at the observatory entrance desks to cover the cost of operation. There is no smoking or alcohol permitted on our observatory grounds. Please drive slowly and carefully and be aware of pedestrians, especially children. Children must be under direct parental supervision at all times. Our helpful and informed all volunteer staff will be happy to assist you to gain in knowledge and appreciation of the night sky. Mingo and Wagman Observatories are owned and operated by the Amateur Astronomers Association of Pittsburgh, a 501(3)(c) and your donations are tax deductible. If you have a few seconds to give, you can help AAAP win a grant through Washington County Community Foundation’s ‘Clicks for Cash.” Simply visit AAAP’s charity’s profile page on wccfgives.org from June 6 to 12. Anyone can vote for AAAP from an Internet enabled device: phone, desktop, laptop, tablet, etc. It is one vote per device, as opposed to one vote per person. 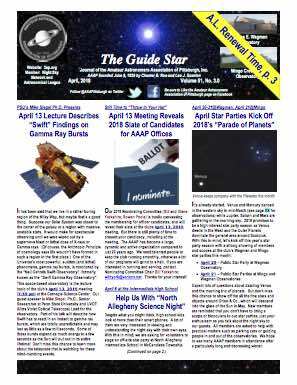 Consider recruiting friends and family to support the Amateur Astronomers Association of Pittsburgh’s 2016 Clicks for Cash campaign. A visit to this URL From June 6 -12, 2016 counts as a vote. The charity receiving the most unique pageviews during the contest period will receive a $3,000 unrestricted grant. Additionally, the WCCF will use the contest results to distribute four $500 unrestricted grants based on a lottery. Each charity will receive one chance for each unique pageview, so the more unique pageviews a charity receives, the more chances that charity will have in the lottery. A computer program will choose the lottery winners at random. Pittsburgh Sky, East, 9:30 PM. June 11, 2016 from Stellarium.org Screen Capture. AAAP Star Parties at both Wagman Observatory and Mingo Observatory, Friday and Saturday, June 10 and 11, 2016 will feature a rich array of celestial delights. Bright Jupiter trails close to the First Quarter Moon. Ringed Planet, Saturn follows not far from the Red Planet, Mars. Mars, not long from its May 30 close approach is still prime for viewing . Saturn, too near its June 2-3, 2016 opposition, is prime for its best viewing of the year. Jupiter is up all evening too, along with all four of its moons. 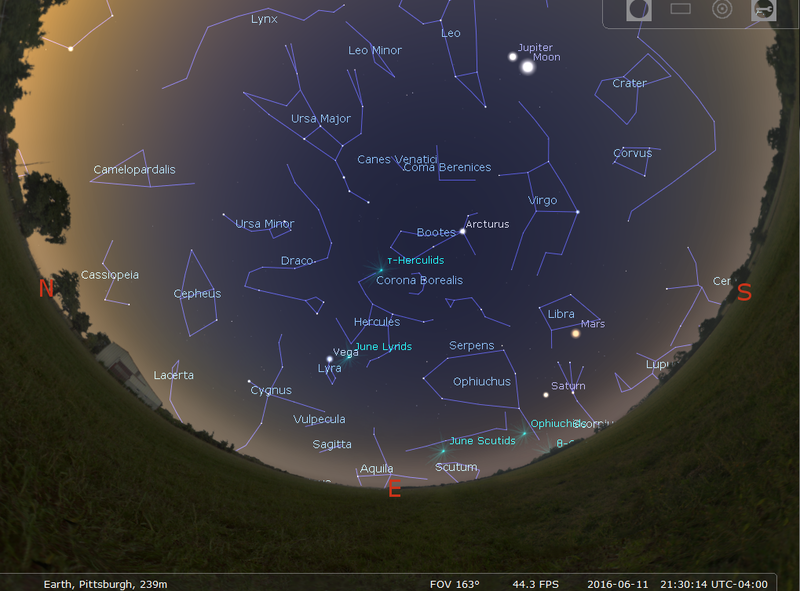 Planet Venus, too graces the sky until just before 9 PM. It only begins with the Moon and these four bright planets. Experience the AAAP telescopes and those of our members as they reveal our solar system and more distant objects, including galaxies and nebula. See the sparkling Great Cluster, M13, in the constellation Hercules and other delights. Look forward to the likelihood of meteor sighting, too. The star parties are free and open to the public.